Setting up Store Promotions in Vend for PC, Mac and iOS – How can we help? 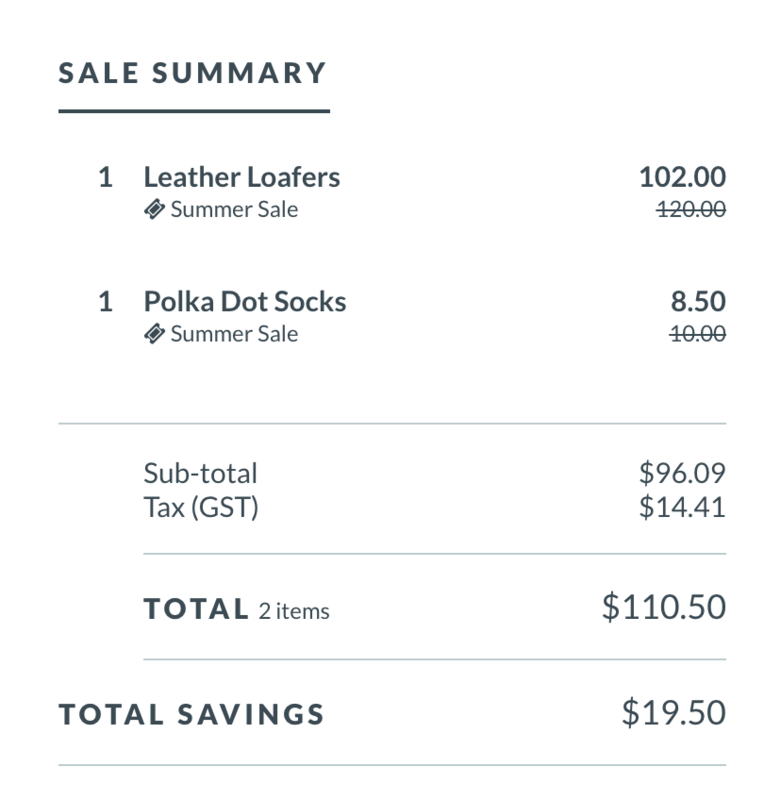 Promotions is Vend's easy-to-use discounting tool for running in-store discounts and sales. Promotions let you set up offers on all or selected products, in just a few simple clicks - without the need for spreadsheets or manual uploads. Plus, live promotions automatically update to include relevant products, customers or outlets as they're added into Vend. To learn how to setup promotions in your store, read on below. Important: For iOS users, the Basic Promotions discounting functionality requires the latest version of the Vend POS iOS app (2.6.2 or higher). Important: Where a promotion and pricebook are active across the same products, customers, outlets and dates, both discounts will be applied. If you don't wish to have both discounts applied, please adjust either the promotion or the pricebook. Find out more. What can I use promotions for? 2. To add new promotion, click the Add Promotion button on the top right side of the page. 3. Give this promotion a name and a short description. 4. Specify the date range for this promotion. 5. And choose which outlet(s) this promotion will apply to. If you select All Outlets, any future outlets that are added to your store will also include this promotion. At this point, you may have the option to choose between either a basic or advanced promotion type. If you have the option to create an advanced promotion and would like to know more about the options available, click here. Otherwise, carry on to step 6 below. 6. Next, set the percentage discount or a dollar discount of this promotion. This discount will be applied to the current retail price of all products included in this promotion. 7. Finally, specify whether this promotion applies to all products or a specific product set. To include only specific products, click 'Specific' and use the search bar to filter by tag, type, brand and supplier. Tip: At this point, you can also choose to make this promotion available to all customers or one specific customer group. This is useful in cases where this promotion is available to VIP or member customers only. Note: Any new customers or products added will automatically be added to an existing promotion. 8. Choose to earn loyalty from promotions. 9. Once you've completed the above steps, click save. You will now see this promotion in your promotions list. You can test this promotion by adding a relevant product or customer group to the sell screen when processing a sale. If you have two or more basic promotions, the larger discount will always apply. An advanced promotion will always take precedence over a basic promotion even if the basic promotion will provide the bigger discount. If you have two advanced promotions, the advanced promotion that is met first will apply. 1. Navigate to Products -> Promotions and click on a promotion in the list below. 2. Once here, click the View Products button to the right of the page. This will open a list of all the products currently involved in this promotion. When you add an item on promotion to the sell screen, the discounted price will be applied. This discount will be reflected in the price of the item, and the name of the promotion will appear below. Important: If you edit either the price or discount amount of a product on the sell screen, this will overwrite any promotions currently applied to this product. Press the Pay button and process the sale as normal, the promotion name and discount(s) will be displayed in the sale summary on the pay screen. Note: The printed and email receipt will also include the promotion name and discount at a line item level. 2. Once here, click the End Early button to the right of the page. 3. 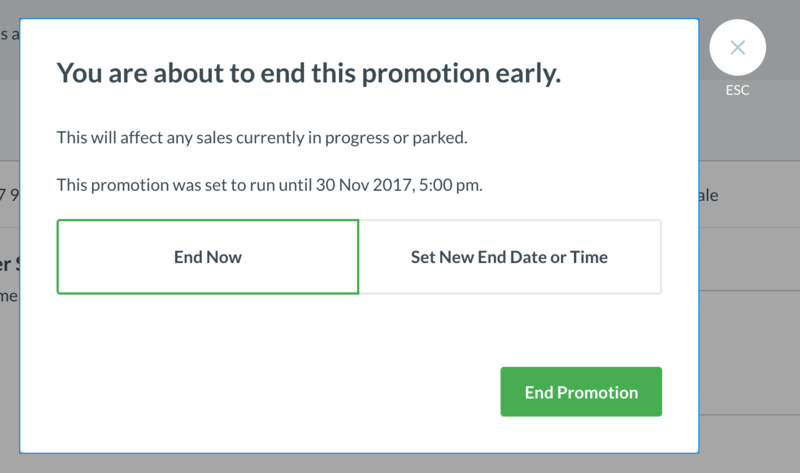 A pop-up will appear prompting you to end the promotion now or set a new end date. Who can add and edit promotions? Adding and editing promotions will be off by default for cashiers and on by default for managers. The admin user can change these permissions on the user permissions screen. If you have one or more active pricebooks and an active promotion for the same products or customers, the promotion will be applied on top of the best pricebook discount. In this instance, only the promotion name will be displayed in the sale summary on the pay screen - even though the price book and the promotion discount would've been applied. If you do not wish to apply both discounts to a product, please adjust either the promotion or the price book. This means that if you have multiple pricebooks that contain the same products or customers, Vend will always apply the one that will give your customer the best price. You have a t-shirt product in your store that is in one pricebook at 30 dollars, another pricebook at 20 dollars, AND you are offering 10% off all t-shirts using a promotion. In this case, Vend will select the lower of the two pricebook amounts, and apply the 10% promotion. For more promotion choices, check out our advanced promotion options here.